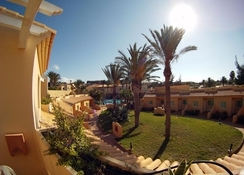 Royal Suite Hotel is situated in the tranquil tourist area of Costa Calma, on the largest of Spain’s Canary Islands, Fuerteventura. This hotel has 166 Family Rooms, each of which comes with a private bathroom, bath or shower, sofa beds, balcony and more. Each of the balconies overlook either the lush palm-lined garden or one of the four fantastic swimming pools (two for adults and two for kids), and there are also rooms available for guests with reduced mobility. This hotel also has plenty of entertainment available for all of the family, offering table tennis, volley ball, a kids’ club and much more – not to mention that it’s a stone’s throw from the sandy beach and a large shopping centre, local restaurants and bars. Royal Suite Hotel is an all inclusive hotel which has a buffet-style restaurant and a lounge bar. However, there are an abundance of bars and restaurants in the surrounding area for guests wanting to eat outside of the complex. Royal Suite Hotel is located only a short walk away from the beach, which offers up a whole range of entertainment and activities for its guests. There are plenty of exciting watersports to be tried down by the beach, such as scuba diving and wind surfing. Guests could also visit the bars down there, or even stroll around the African Market, which is open every Wednesday and Sunday. There is also an abundance of bars and restaurants within walking distance from the Royal Suite Hotel, which is perfect for the guests wanting to eat outside of the complex. Royal Suite Hotel has 166 Family Rooms in total. Each of the rooms come with a balcony, which overlooks either the garden or the outdoor swimming pool. These spacious rooms have two sofa beds in the living room and then two single beds in the bedroom. The rooms come with a flat screen satellite TV, private bathroom, free wifi, a bath or shower, alarm service and more. Royal Suite Hotel also has rooms which have been adapted for guests with reduced mobility, which are available on request. Royal Hotel Suite is an all inclusive hotel, which has a buffet-style restaurant offering up hot and cold meals as well as a variety of desserts. There are also beverages available between 10:30 am to 11pm. 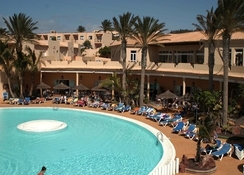 The hotel also has a lounge bar, which has an outside terrace that sits around the swimming pool. The lounge bar offers up a large range of drinks and snacks. This hotel’s prime location also means that you don’t have to walk too far in order to find somewhere else to eat, if you’re looking for a cafe or restaurant outside of the complex. Royal Suite Hotel gives its guests the chance to choose between four swimming pools; two outdoor swimming pools and two swimming pools for children, which is perfect for the hot days when you need to cool off. For those who have brought their little ones along, there’s a mini club for children over the age of four years old. 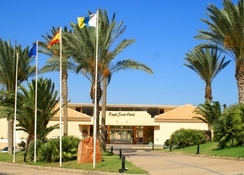 This hotel also has a tennis court, volley ball court and table tennis, giving guests the chance to try something new. As well as these, there is also the chance to try various water sports in the surrounding area. I stayed here in July with my 2 teenagers. Thoroughly enjoyed our time there. Staff were amazing. Apartment was spotless. Staff in the complex worked really hard to ensure everyone's needs were met. The food was lovely, plenty of choice for different tastes. The reviews I read before I booked were mixed, but I was extremely impressed with this complex. The staff work so hard & the complex was spotless. We will definitely be back for another visit. Never queued for a drink during the day as there was a help yourself section which was fully stocked. Coffee machine. Juice machine, orange/apple/pineapple. Plus a fizzy juice machine (includes diet pepsi). The beer on tap was amstel & also had white/red/rose on tap. Pools were lovely & clean. Also had a milkshake machine inside & other coffee/Juice/beer/wine section beside the bar that opened for the evening. You aren't limited to the amount of free drinks you can get at each bar visit either. Was never much of a queue here either if you timed it right to go up. The entertainment was a little repetitive but think you get that wherever you go. Plenty for younger kids to do. Other reviews mentioned a lot of Germans staying, which is true but this didn't bother us at all. Found them friendly enough. Plus speak German so was handy. Actually preferred it to other resorts that have lots of loud british tourists. Highly recommend this place. Had a great stay at the Royal Suites in Costa Clima. This is a three star all inclusive hotel and you get exactly that. The food was really good with some unusual dishes thrown in for good measure. The Goat Stew was particularly good. I would not however recommend the Al la carte restaurant, this was not the best although the staff tried extremely hard to please. All staff at the hotel were great, especially on reception. We arrived late in the evening after the restaurant had closed, but there was still food provided for us. My wife and I are not big drinkers but I was impressed that during the day the bar was a serve yourself affair, so not queuing. The hotel has an indoor pool as well as the main pool and this was great. A thoroughly relaxing week. first class for the price. The hotel was very nice and staff were very friendly. The hotel was more geared toward German's as they were far more friendly towards them and spoke to them more. Apart from that it was very enjoyable. The entertainment was a bit lacking and there was not much to do. Some areas needed a bit of work, as showing a lot of wear. I will say that the food was good and the holiday was nice as needed a bit of a relaxing one. If you want lots to do or entertainment then this is not the place for you. Only a small review. Very surprised with this hotel. Help yourself bar and excellent food. Great for a relaxing holiday with family or couple. However if you want night life and want to party this isn't the place for you. Hotel and rooms very clean would I go again yes without doubt! Excellent hotel, small, cosy and quiet but not great location as a bit of a walk to anywhere. Staff fantastic, food great - traditional Canarias faire of fish, goat and veg so no burgers and chips etc but all delicious. Pool almost to our selves in the first week of December. Lovely clean hotel and we had a great relaxing time. It's not 5* but we didn't expect it to be. You get what you pay for.